Guava is a nutritious and delicious fruit that tastes like a combination of pear and strawberry. It is high in vitamin A, vitamin C, vitamin E, niacin, thiamine, iron, calcium, potassium, phosphorus, manganese, etc. In addition, it has a high fiber and water content. This tropical fruit also has digestive, carminative, antihyperglycemic, antispasmodic, antibiotic, sedative, anti-inflammatory, and anti-cancer properties. It helps treat acne, cure piles, lower the risk of diabetes, promote fertility, and relieve digestive disorders such as constipation, diarrhea, stomach ache, and acidity. Plus, it works as a filling snack and yet aids in weight loss. Regular consumption of this fruit is good for your skin too. Guava has white or maroon pulp with plenty of small seeds packed within. Although the seeds of most fruits and vegetables are discarded as they cannot be digested, guava seeds need not be treated in the same way as they are edible. In fact, they are great for your health as they are packed with antioxidants. They are also rich in other nutrients, essential fatty acids, and contain a good amount of iodine. The seeds and skin of this fruit have glycosides, carotenoids, and other phenolic and flavonoid compounds. They also have anti-inflammatory and antibiotic effects. Discussed below are some health benefits of guava seeds. The bioactive compounds and antioxidant power of guava seeds also help control body weight, glycemia (concentration of glucose in the blood), dyslipidemia (high amounts of lipids in the blood), triglyceride levels and other factors that contribute to an increased risk of cardiovascular disease. Guava seeds, especially when ingested whole, are useful for those suffering from constipation because of their stimulant laxative effect. The seeds are also a good source of dietary fiber that aids in digestion. 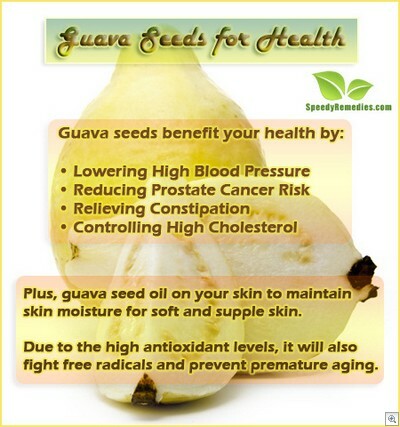 So, eat guavas with seeds to promote bowel movement and relieve constipation. For best results, it is often suggested not to chew the seeds; rather swallow or gulp the small seeds after chewing the pulp or else it may cause acidity. Guava pulp and seeds help restrict the development of cancer cell lines. They are high in an antioxidant called lycopene that fights prostate cancer. It is also suspected to help inhibit the growth of breast cancer cells. Antioxidants are extremely important in preventing and controlling cancer as they help the body defend itself from the proliferation of free radicals. Studies have also found guava seed extracts to have anti-cancer effects on hematological and solid neoplasms. In addition to guava seed extracts, studies have also evaluated guava leaf extracts. Leaf oil, and whole plant extracts for chemotherapeutic applications. Guava seeds contain polyunsaturated fatty acids that help manage high cholesterol by keeping blood cholesterol levels in check. Moreover, the seeds being rich in fiber, interfere with the absorption of bile in the intestines. As the bile is eliminated in the feces, the liver makes bile salts to make up for the loss of bile. This helps reduce cholesterol in the bloodstream because the body uses it to produce the bile salts by increasing the production of LDL receptors. If you do not like to eat guava seeds yet want to derive the health benefits of this food then you can get guava seed extract from the market. It is rich in vitamins, minerals, antioxidants, and essential fatty acids. Moreover, you can apply guava seed oil on your skin to maintain skin moisture for soft and supple skin. Due to the high antioxidant levels, it will also fight free radicals and prevent premature aging and wrinkles. Being astringent in nature, it will also promote skin tightening. When applied to the scalp, it will help control dandruff, prevent hair loss, and make your hair strong and shiny. When purchasing guava seed oil, make sure you get an organic one. Hey ! You’ve got some amazing tips and information about guavas , but can you post more benefits of it in either for hair or skin? Thanks !